Keen walkers are attempting to revive interest in the tongue-in-cheek "tradition" of marching en masse around a county "for no particular reason". 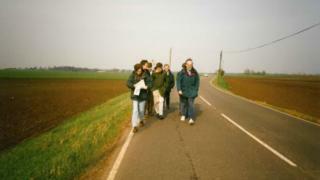 The March March march involves people marching from the Cambridgeshire town of March during the month of March. Thought up by a Cambridge University mathematician in 1979, numbers have dwindled from a high of 27 marchers to this year's meagre four. Organisers are hopeful of bolstering numbers before it dies out completely. Back in the 70s, Jonathan Partington, a member of the university's pure maths department "saw the town of March, put the links together and said, let's do this walk", Colin Bell, this year's organiser, said. "Then they did it again, and as these things do, it became a tradition." According to the march's website, "the March March march is a long, flat, pointless walk across the Fens from the town of March to Cambridge, a distance of about 30 miles". "It has no purpose other than to be called the March March march" and was "invented because it seemed like a good idea at the time." Highlights of the route include "lots of gnomes in Doddington" and "an interesting ice skating sculpture at Earith," Mr Bell said. "Sometimes we sing to pass the time. There's a song called the March March March March - but it isn't really a march. It's Frère Jacques with various place names inserted." Some years the march simply has not happened at all when no-one turned up. Other marches have been cut short by natural phenomena. "We got caught in the Fen Blow once and had to give up near Chatteris," Mr Bell said. The Cambridge University tradition is, he fears, in danger of dying out as people associated with it get older or move away. "I think it's a joke that's gone a bit too far... but there are enough mad people out there to properly revive the tradition," he added. Barring blisters or more Fen Blows, the marchers expect to finish this year's trek at about 20:00 GMT in Histon, just outside the city.